Though it ranks at the bottom of Will Ferrell's catalog, 2006's Talladega Nights: The Ballad of Ricky Bobby exhibits the chemistry between Ferrell and co-star John C. Reilly. 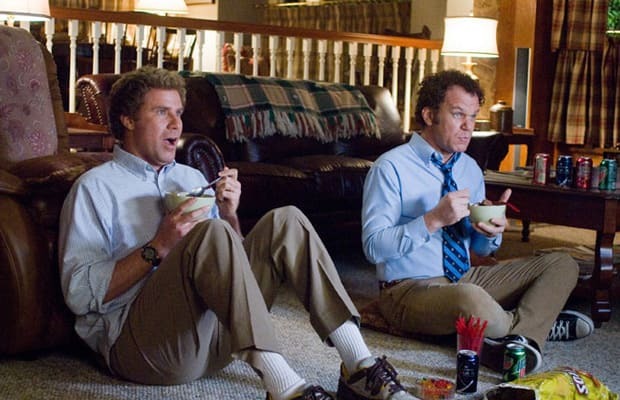 Step Brothers, however, maximizes on their interplay to the point of uproarious combustion. The simple plot—two 40-year-old man-children become step-siblings against their will—is the perfect setup for Sirs Ferrell and Reilly to constantly one-up each other with delusionally egocentric boasts ("I've been called the songbird of my generation") and ruthless insults ("You and your mom are hillbillies; this is a house of learned doctors"). Easily Ferrell's second-funniest movie (keep reading this list for the first), Step Brothersis one of those special comedies that remains laugh-out-loud hilarious with every subsequent viewing. It's a modern-day classic for "Boats N Hoes" alone.